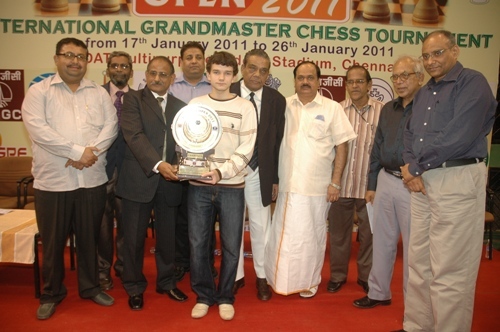 Grandmaster Kravtsiv Martyn secured 9.5 points from eleven rounds, and was followed by Tamir Nabaty, Ni Hua, Alexander Areshchenko and Baskaran Adhiban. Martyn took home the winner's prize of Rs. 200000 (Rupees two lakhs only), while the shared second place quartet were awarded Rs.93500 (Rupees ninty three thousand five hundred only) each. The cash prizes for the top 35 spots along with age category prizes were distributed by Mr. Shri V M Mohan, Joint President, Corporate Finance, India Cements Ltd, in the presence of Shri S Ganesan, Chairman, Organising Committee, Shri D V Sundar, Hon Secy, All India Chess Federation, International Master & Government observer for chess Shri Manuel Aaron, Shri J C D Prabhakaran, Vice President, Tamil Nadu State Chess Association, Shri Bharat Singh Chauhan, President, Commonwealth Chess Association, Shri R M Dongre, President, Asian Zone 3.7 and India's first International Arbiter V Kameswaran.